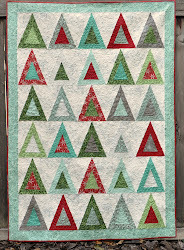 I just found out about mini-quilt Monday today on my google reader thru AmandaJean and Apple Cyder. And Jacquie mentioned it a while back too, when she posted her cute clothesline quilts. These will be for sale later in the week along with some other things, maybe a tote bag, maybe a baby dress, maybe a cute little girl skirt or something. I have a funny idea for part of the huge pear fabric I got. I did finish some things last week and today so I think I'm doing well! These are adorable! I love the fabrics, too! good luck with your etsy shop! 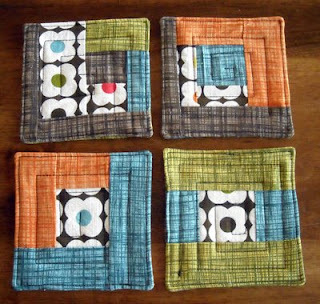 love the coasters and your cloth napkins. these are lovely. I haven't made a quilt but I think I can attempt a mini quilt with less fear. Very cute! I have some of the kitchen towels which after washing were not printed on the grain and are very skewed. I just might have to make something like this!